One of the reasons for the immense popularity of shortwave radios is the fact that they are easy to carry devices that can be your companions anywhere; travel, trekking, camping, emergency situations and so on. Portability makes them very convenient for day-to-day use. However, planning a purchase for a portable easy-to-carry shortwave radio can be slightly daunting since there are so many of them available in the market. And while portability is an important factor, you cannot ignore the basic functions, price, durability, and other features without which a portable radio would simply be a compromise. In this article, we'll discuss what we believe to be the top five portable shortwave radios in the market today and also provide our recommendation for the best portable shortwave radio out of the five. A shortwave radio should set the right balance between features and portability. It should be a device that will be the best of the pick among various radios available in the market and still be portable enough to meet your travelling needs. With this in mind, we’ve picked the top 3 of the most portable and versatile shortwave radios available in the market today. They are rich in features, highly portable, and value for money devices that we wholeheartedly recommend. If portability was your only criteria or perhaps the most important one, we would recommend you to buy the Tecsun PL-380 with eyes closed. This unit is the smallest among its other two competitors. It is an ultra-portable radio so small that it can easily fit is the regular-size pockets of your shirt or trousers. But does it skimp on the features due to the ultra-small size? We don’t think so. Despite the size, the Tecsun PL-380 is a very well-rounded shortwave radio. Excellent buttons that are a delight to operate, a simple lock mechanism to activate/deactivate all the controls, and an antenna that works three ways to help the radio receive even the remotest of signals make it a very competent radio that ticks all the boxes. The sound volume of the device is a bit low when compared to the other radios reviewed in this article, but considering how small the radio is it is something we can live with. However, we didn’t find any issues as such with the quality of the audio. As we said at the beginning, this shortwave radio is an extremely travel-friendly device that can be carried in your pocket. Speaking of pockets, with its low price as well, it also will not burn a hole in one of those pockets it is carried in. The C Crane CC Skywave is a good-looking, small, and yet durable shortwave radio. It is small enough to fit in your backpack or pockets of your travel bag. This radio is known as one of the most durable ones out there. With an LCD that has an LED backlight, the display too is good from all angles. It is easy to operate and has nice set of buttons that provide a good tactical feedback. Equipped with a built-in station allocation feature and five bands, it is extremely easy to add a station to the memory. Just hold on to the station you’ve just located for two seconds and that’s it. The C Crane CC Skywave is a beginner-friendly radio, even though there are certain advanced features that may require you to reference the manual at times. Less sensitivity due to shorter antenna. As the name suggests, the Eton Executive Traveler is meant to be your travel buddy. It is an affordable and portable shortwave radio that can receive long wave, AM, FM and shortwave bands. The Eton Executive Traveler also supports RDS data display in the FM band making it rather unique. The display itself is quite big. You can control the brightness and has good viewing angles from all sides. Another unique feature of the radio is that you can set the local as well as world time on it, set up an alarm clock, and use the snooze light. The nifty display also displays the temperature of the different regions of the world helping you prepare, climate-wise for your trips. As you can see, if you travel frequently and need a radio for those travels, the Eton Executive Traveler with its small size, 500 memory presets, and numerous features is difficult to ignore. Our only small grouse with the device is the tuning knob’s placement which is below the display; a tad inconvenient to use and definitely unconventional. While shortwave radios aren’t that big in size, when you are looking for portability, size of the radio does assume a great deal of significance. But we strongly recommend that you should not lose sight of the at least the basic features of a shortwave radio. Your choice should strike the right balance between features and portability. Determine your minimum requirements and then ensure that the shortwave radios you consider meet the criteria we list below. 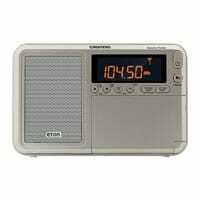 Shortwave radios have the following sizes; large table-tops, compact portables, and small ultra-portable radios. For this discussion, we’ll exclude the table-tops as they clearly don’t fit the scope of this article. Portable radios: As the name suggests, these are very easy and convenient to take anywhere. Be​cause of their small size, you can fit them in your backpacks or luggage. They are the most commonly bought radios. Ultra-Portable Radios: These are very small and can usually fit in your pockets making them invaluable travel companions. They are also very minimal when compared to bigger full-sized shortwave radios. They are also not that great in picking up every signal. But if you are just starting with your shortwave radio hobby, these radios prove to be a great buy. A shortwave radio picks up signals as per its ability to receive different bands. These band allocations are AM, FM, longwave, shortwave and so on. You should evaluate if the radio you are considering does support the frequency band you would like to listen to. 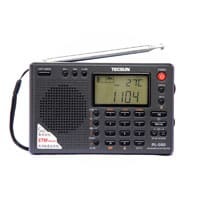 There are some shortwave radios that do not have a digital display, and hence when you are looking to find a station you can’t see the frequencies. This can be extremely frustrating. So that's why we always recommend buying a radio that has a digital display showing various frequencies when you are trying to tune in. This is not just convenient but a feature that should be available in every modern radio. An antenna, built-in or external, plays a pivotal role in the ability of the radio to pick signals. While most built-in antennas work satisfactorily, we strongly recommend buying a unit that has support for an external antenna as well. This will significantly increase the ability of the radio to pick even the remote signals. While all the three radios in our review are great, portability-wise, our pick for the best portable shortwave radio is the ever-so-small and yet powerful Tecsun PL-380. It is portable enough to be carried in your pocket, has a great reception, is priced very competitively, and has five different bandwidths and 550 memory presets packed in such a small size. If you can live with a slightly low sound and unhelpful user manual (it is not in English language), the ultra-portable Tecsun PL-380 will not disappoint you. We've create a buyer's guide that will tell you everything you need to know to buy the perfect shortwave radio.